Mindfulness is a stress-reducing strategy where an individual develops awareness that arises through paying attention, on purpose, in the present moment, non-judgmentally and accepting them as they are. An individual attempts to control the focus and direction of their attention without rejecting or suppressing thoughts. 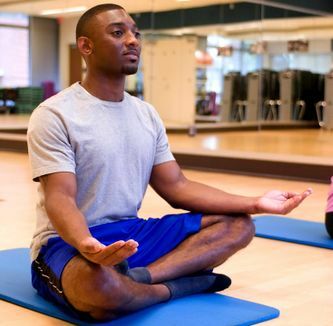 It has been proposed that mindfulness could be utilised in an integrated body-mind intervention for lower back pain for a subgroup of patients who have higher disability due to increased emotional and psychological needs. Kabat-Zinn describes seven core components of mindfulness practice which interact with each other. They are non-judging, patience, a beginner's mind, trust, non-striving, acceptance and letting go. A practitioner of mindfulness is required to recognise the constant stream of judging and reaction to experience. They then need to distance themselves from this by becoming an 'impartial witness'. Kabat-Zinn states that we react to events and experiences often by labelling them as neutral, good or bad. Neutral things become background noise which we give little attention to. When judgmental thoughts enter the practitioners mind they are advised to suspend judgement by simply observing them without pursuit or action. An individual taking part in mindfulness should understand that sometimes things unfold in their own time. The process of mindfulness allows us to cultivate patience toward our own minds and bodies. It is a common that practitioners find that their minds have 'a mind of their own' and require a large amount of attentional demand as well as an emotional response. Patience is particularly helpful in these moments. ↑ 1.0 1.1 1.2 1.3 Kabat-Zinn J. Full catastrophe living. New York: Bantam Books Trade Paperbacks; 2013. ↑ Mindfulness-Based Functional Therapy: a preliminary open trial of an integrated model of care for people with persistent low back pain. Schütze R, Slater H, O'Sullivan P, Thornton J, Finlay-Jones A, Rees CS. Front Psychol. 2014 Aug 4;5:839. doi: 10.3389/fpsyg.2014.00839. eCollection 2014. ↑ Shapiro Jr DH. Adverse Effects of Meditation: A Preliminary Investigation ofLong-Tenn Meditators. International Journal of Psychosomatics. 1992;39(1-4):63. ↑ Dobkin PL, Irving JA, Amar S. For whom may participation in a mindfulness-based stress reduction program be contraindicated?. Mindfulness. 2012 Mar 1;3(1):44-50. Mindfulness-Based Functional Therapy: a preliminary open trial of an integrated model of care for people with persistent low back pain. Schütze R, Slater H, O'Sullivan P, Thornton J, Finlay-Jones A, Rees CS. Front Psychol. 2014 Aug 4;5:839. doi: 10.3389/fpsyg.2014.00839. eCollection 2014. Non-pharmacological interventions for somatoform disorders and medically unexplained physical symptoms (MUPS) in adults. van Dessel N, den Boeft M, van der Wouden JC, Kleinstäuber M, Leone SS, Terluin B, Numans ME, van der Horst HE, van Marwijk H. Cochrane Database Syst Rev. 2014 Nov 1;(11):CD011142. doi: 10.1002/14651858.CD011142.pub2. Review. Physiotherapists supporting self-management through health coaching: a mixed methods program evaluation. Dufour SP, Graham S, Friesen J, Rosenblat M, Rous C, Richardson J. Physiother Theory Pract. 2015 Jan;31(1):29-38. doi: 10.3109/09593985.2014.930769. Epub 2014 Jul 1. Finding Ways to Lift Barriers to Care for Chronic Pain Patients: Outcomes of Using Internet-Based Self-Management Activities to Reduce Pain and Improve Quality of Life. Rod K. Pain Res Manag. 2016;2016:8714785. doi: 10.1155/2016/8714785. Epub 2016 Mar 1. Mindfulness Is Associated With Treatment Response From Nonpharmacologic Exercise Interventions in Knee Osteoarthritis. Lee AC, Harvey WF, Price LL, Han X, Driban JB, Wong JB, Chung M, McAlindon TE, Wang C. Arch Phys Med Rehabil. 2017 Nov;98(11):2265-2273.e1. doi: 10.1016/j.apmr.2017.04.014. Epub 2017 May 12. Effects of Tai Chi versus Physical Therapy on Mindfulness in Knee Osteoarthritis. Lee AC, Harvey WF, Wong JB, Price LL, Han X, Chung M, Driban JB, Morgan LPK, Morgan NL, Wang C. Mindfulness (N Y). 2017 Oct;8(5):1195-1205. doi: 10.1007/s12671-017-0692-3. Epub 2017 Feb 23. The role of nonpharmacologic therapies in management of chronic pelvic pain: what to do when surgery fails. Till SR, Wahl HN, As-Sanie S. Curr Opin Obstet Gynecol. 2017 Aug;29(4):231-239. doi: 10.1097/GCO.0000000000000376. Review. Trial Protocol: The use of mindfulness-based intervention for improving bracing compliance for adolescent idiopathic scoliosis patients: protocol for a randomised, controlled trial. Yip BHK, Li X, Leung CHY, Gao T, Chung VCH, Yu FWP, Lam TP, Cheng JCY, Wong SYS. J Physiother. 2018 Jul;64(3):193. doi: 10.1016/j.jphys.2018.02.019. Epub 2018 Jun 12. Effect of physical therapy management of nonspecific low back pain with exercise addiction behaviors: A case series. Anandkumar S, Manivasagam M, Kee VTS, Meyding-Lamade U. Physiother Theory Pract. 2018 Apr;34(4):316-328. doi: 10.1080/09593985.2017.1394410. Epub 2017 Nov 7. Non-pharmacological self-management for people living with migraine or tension-type headache: a systematic review including analysis of intervention components. Probyn K, Bowers H, Mistry D, Caldwell F, Underwood M, Patel S, Sandhu HK, Matharu M, Pincus T; CHESS team. BMJ Open. 2017 Aug 11;7(8):e016670. doi: 10.1136/bmjopen-2017-016670. Review. Treatment of Chronic Lower Back Pain: Study Protocol of a Comparative Effectiveness Study on Yoga, Eurythmy Therapy, and Physiotherapeutic Exercises. Büssing A, Poier D, Ostermann T, Kröz M, Michalsen A. Complement Med Res. 2018;25(1):24-29. doi: 10.1159/000471801. Epub 2017 Jul 3. Complementary and Alternative Medicine and Exercise in Nonmotor Symptoms of Parkinson's Disease. Subramanian I. Int Rev Neurobiol. 2017;134:1163-1188. doi: 10.1016/bs.irn.2017.05.037. Epub 2017 Jul 14. Review. Psychological treatments for the management of postsurgical pain: a systematic review of randomized controlled trials. Nicholls JL, Azam MA, Burns LC, Englesakis M, Sutherland AM, Weinrib AZ, Katz J, Clarke H. Patient Relat Outcome Meas. 2018 Jan 19;9:49-64. doi: 10.2147/PROM.S121251. eCollection 2018. Review.